Minnesota produces the most turkeys in the US, and Californians consume the most turkey on Thanksgiving. Wild turkeys can run 20 miles per hour when they are scared, but domesticated turkeys that are bred are heavier and can’t run quite that fast. Each year, it’s tradition for the president of the United States to pardon a turkey. The president isn’t the only one pardoning a turkey on Thanksgiving–about 88% of Americans actually eat turkey on Thanksgiving. Perhaps the 12% who don’t just aren’t turkey fans. Or…maybe they’re saving room for the tastiest dish at the big feast….the dessert! Forget all the fuss over the turkey on Thanksgiving. We all know everyone really looks forward to the sweets. You can never have too many desserts! Let’s be honest, they’re the real show-stoppers of this extravagant meal. This Banana Split Ice Cream Sandwich Cake is a fun twist on the classic banana split dessert. It is made with FatBoy’s infamous chunky, rich, ice cream sandwiches, with all the old-school banana split ingredients (caramel, hot fudge, whipped cream, bananas, and cherries). This easy, no bake dessert is the perfect way to end your Thanksgiving feast. And because it takes less than 15 minutes to assemble, you won’t be slaving away all day in the kitchen to make it. Kick your feet back, and enjoy the creamy goodness of this old school classic-inspired cake. Your eyes will be bulging out of their sockets when you see this jaw-dropping trifle. Not only is this decadent dessert beautiful, but it’s packed full of flavor! It combines spice cake with layers of a light and creamy pumpkin mousse, sweet caramel, and a little chocolatey-toffee crunch. It merges all of your favorite fall flavors into one treat. This delightful dessert has the perfect soft to crunch ratio. The pumpkin bread is infused with ginger, nutmeg, and cinnamon giving it an extra pop of flavor. Add to that the creamy homemade bourbon sauce and the crunchy pecans, and you’ve got one savory dessert. Anyone else out there a huge fan of crumb-toppings? Then these bars are for you. A brown sugar oat crumble serves as both the crust and topping for these bars. Filled with cinnamon spiced apples and topped with caramel sauce, you’ll love this easy fall dessert. In between those two delectable layers are thinly sliced cinnamon-spiced apples. Eat this yummy treat warm or cool, just make sure to drizzle it with some extra salted caramel sauce. Enjoy a little slice of heaven on earth with this tart and flavorful treat. These mini pies blend cranberries and apples to create the ideal fall pastry. They’re infused with cinnamon and nutmeg for a good spice, then topped with a crunchy brown sugar streusel. This old fashioned applesauce cake is soft, moist, and packed full of spices. The layers of cream cheese frosting help balance out the spices, and the caramel drizzled over top will have you licking your fingers all weekend. You’ll be coming back for more of this tasty treat. Pecan lovers will fall head over heels for these fabulous nut bars. The vanilla shortbread crust is soft, yet firm, and holds the caramelized pecan pie topping well. With over two pounds of pecans and brown sugar, you can’t go wrong with flavor. It’s the perfect nutty sweet treat. Don’t be fooled by the name of this delightful treat. Just because the word “salad” is in the title doesn’t mean it can’t taste good. This delightful dessert calls for only five ingredients and perfectly fuses together some sweet, tart apples with luxurious cheesecake filling. It’s then topped with caramel and Snickers to create an amazing fruit salad that will blow your mind! Your family will go nuts over it. It’s not Thanksgiving until you’ve indulged in some scrumptious cream pie. This peanut butter chocolate cream pie is no exception. The crust is made from rich chocolate sandwich cookies mixed with peanut butter cups for the perfect blend of chocolate to peanut butter ratio. Just one bite is all it takes to experience the sweet, light and fluffy peanut butter filling with bits of peanuts throughout. The topping combines homemade whipped cream and a generous amount of your favorite Reese’s Peanut Butter Cups, peanuts, and chocolate. What else could you dream of? 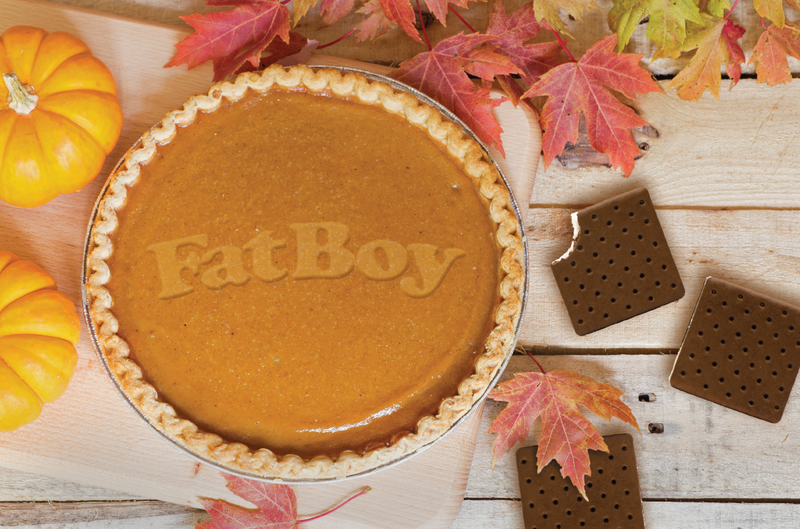 From all of us here at FatBoy, we hope you enjoy celebrating Thanksgiving with your loved ones this week!